If you dropped $US20 on an HD movie from iTunes since they came out yesterday, but have a newer Mac and an older external display, you might not be able to watch it. 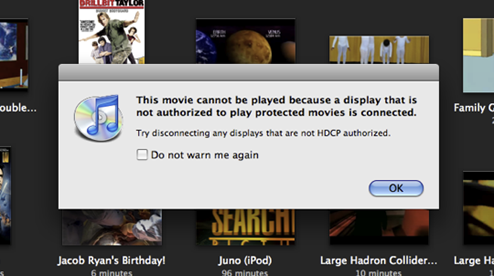 That's because iTunes HD movies require that you have an HDCP-compliant external display. High-bandwidth Digital Content Protection is designed to prevent video from being copied as it moves across digital video interfaces. So, as iLounge points out, if you're using a Cinema Display older than Apple's 24-inch LED model (or any older DVI or VGA monitor, basically), you're screwed if you have it hooked up to a newer, HDCP-loving Mac. You just get a black box where the video should be. It's not the first time HDCP has caused iTunes-related pain. When Apple first started rolling HDCP, they even applied the protections to standard definition content, so a whole bunch of people found out they couldn't play new movies they bought, so Apple wound up pulling back on SD, and everyone forgot about it until yesterday, when you could finally buy HD movies.